Anyone wanting a quick and informative review, head over to Liz's blog entry at vintage-a-peel because I'm going to ramble and muse a lot here. 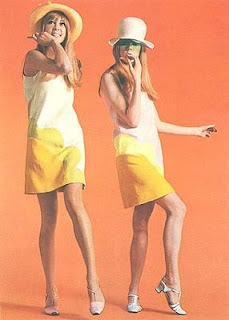 I promised to post properly about this forever ago and am only getting around to it now because of the lovely new Youthquake tour pictures Lynn has posted over at Pattie Boyd's Sixties Style. I was lucky enough to be invited to the much anticipated launch for both the book and exhibition because the lovely M had put me on the guest list after I'd almost jumped up and down at the mention of a Foale and Tuffin book (embarrassingly during the launch party for the John Bates book and therefore in the presance of John Bates when I'd previously been doing very well at appearing half normal... well, apart from my bright pink Westwood cardigan and my hair-do which encouraged someone to take pictures of it from all angles) and then supplied an excited ramble about them being the Peter Blake of the fashion world when asked what questions I'd like to see answered in the book. 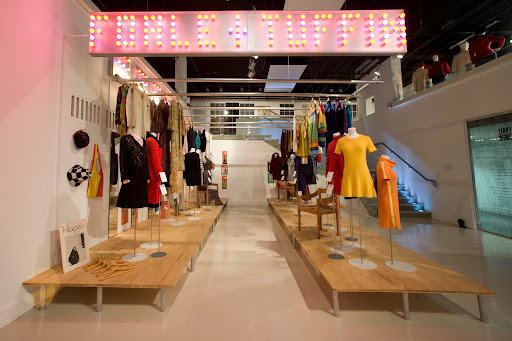 The downstairs area of the exhibition was mainly arranged to emulate the original F&T shop with items not only on mannequins but also hung in enticing rows near a faux changing room and surrounded by the accessories sold alongside them at the time. So many items of clothing I'd only seen in books before. When you're someone who wears vintage fashion and collects vintage magazines, one of the most frustrating things (yet not as frustrating as the existance of Kate Moss) is sighing over pictures of outfits that you may never see in person, let alone own or find in your size. In my early twenties when I lived in Liverpool and immerced myself entirely in 60s culture (a home full of 60s furniture, listening to vinyl, wearing 60s clothes every day and reading only magazines from that period because I found the modern clothes and modern discussions in up to date magazines somewhat distasteful) stepping out of my front door into the modern world was always a culture shock. 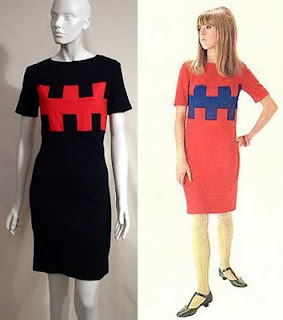 I'd often be reading through new magazine finds, spot a fabulous outfit, read it's price and who it was by and think "ooh, that's not too expensive and there's one of those shops down the road" and then reality would hit and I'd realise the shop would have been out of stock of this item over thirty years ago. At the F&T exhibition two such dresses that I'd had this experiance with were within excruciating touching distance and yet I couldn't go and try them on. I didn't dare wear either of my F&T pieces because Liz had previously terrified me over the lovely designers reactions to the condition of some of their old pieces and one was a little worse for wear while the other was too casual for a party. I instead opted for something that could never be considered too casual for a party. One of the most fun to wear things in my wardrobe which is saying something when over half of my wardrobe is basically fantasy flamboyant fashion. Despite my tastes in fashion, make-up and hairstyling I'm not a very outgoing person. Unless you put me in the right outfit around the right crowd. The crowd at the launch all seemed to be wonderful, free minded, creative types wearing fabulous clothes and make-up so I ended up doing what you just have to do in this outfit and flounced about like a dancing butterfly talking to loads of people who just walked up to me to admire my rainbow sequin ensemble and take pictures of it. I wished I'd had a stack of Liz's business cards to hand out, but instead explained where I'd got my sequin trouser suit and pointed Liz out in the crowd. On the way around the exhibition you could help but be in awe of the video installations playing. I spent a lot of time watching them, loving the 60s footage set in among the footage of the pieces being modelled in the modern day. 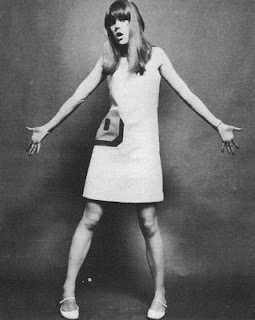 I especially loved the way that the new model they'd chosen was being instructed in sixties modelling poses by the original F&T model Jenny Boyd. Other people around me kept asking each other "is that Marianne Faithfull" and I corrected them all that it was in fact Jenny. To my great excitement Jenny herself was present, and after I'd gone to get my book signed by the lovely Marion and Sally I plucked up the courage to pounce demurely upon Jenny. She seemed a little surprised to be asked for her autograph but was absoloutely lovely about it and I came away finding her easier to chat to than her sister Pattie who had - if I'm honest - terrfied me when I met her. I don't think it really helped back then that I'd long admired her modelling career and was therefore a tad nervous to be in her presance, or that I'd arrived almost like a mini not-as-cute 60s version of her with my long blonde hair sixtied to the max and resplendant in a Dollyrockers mini dress and Biba velvet jacket. Anyway, back to Jenny who was a pleasure to meet. I remembered to say how much I loved her book Musicians In Tune for being fascinating, enjoyable to read and absoloutely spot on as a psychological study if the mind of the musician. I think I rather shocked her by knowing about her book, but she was gracious and seemed pleased to hear my thoughts on it. The original Foale&Tuffin crowd with Jenny fourth from left. side of the trouser suit Jenny wore for the event. 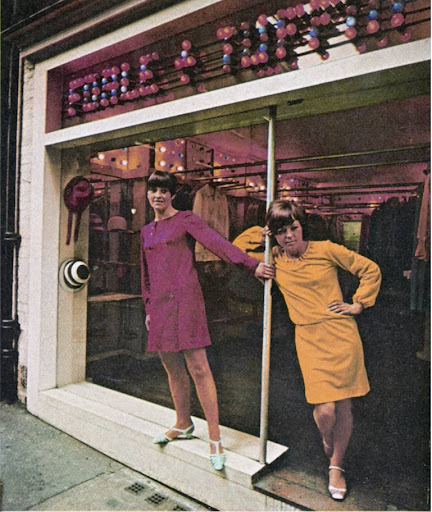 As well as the fabulous clothes, the walls of the exhibiton were filled with well placed images from fashion magazines of the era featuring their clothes. Having spent a lot of my free time in the Liverpool days sat in the Picton Library looking through the bound 1960s volumes of Vogue, Tatler and Queen there wasn't anything to surprise me in the images, but it was fabulous to see them in this context. 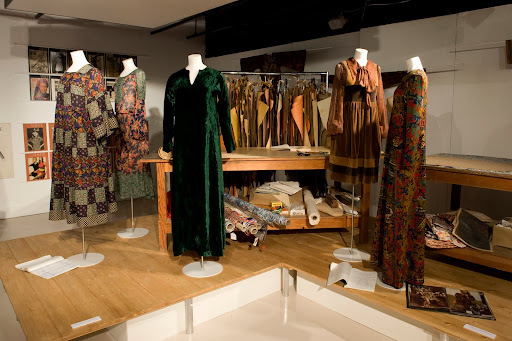 The main section upstairs was styled to represent the work room and was scattered with unused buttons, labels and buckles and piled high with the original patterns for their work which in all honesty made me feel honoured to be there. People didn't even get to see that in the 60s. 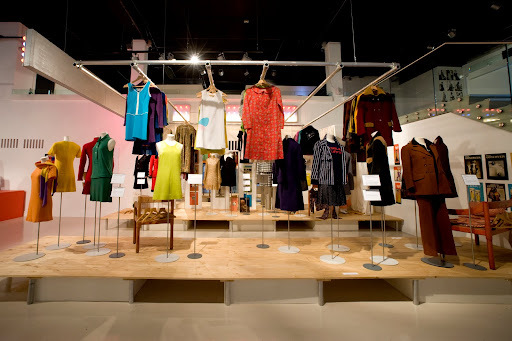 Another fabulous part of the upstairs display was the section dedicated to the two designers' modern day work. 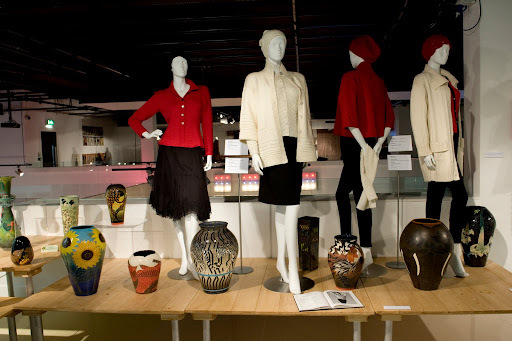 Marion Foale moved into knitwear while Sally Tuffin went on to become one of the UK's leading pottery designers. Later we moved on to the after party where I quickly found us a booth to sit down in and we spent the rest of the evening there eating cake and I tried to walk as nonchalantly about as you can in a full length rainbow sequin ensemble when Jenny Boyd is sat at the next table to you. Awwwww. This is such a lovely review and I'm blushing. Such a lovely night. And....I miss you! You're right, I so would! Men in beautiful make-up are the least scariest people in the whole wide world. ..unless you idolise them and their skill, in which case you want to be wearing a Venetian Mask to cover your own work before you dare approach them. When we get round to going to one of Mr Strange's club nights I shall be sporting a paper bag over my head. Possibly one over my whole outfit. The only other option is to spend all day literally painting my face with single bristle brushes. As for the nice man at the F&T opening, he totally introduced himself before I'd even noticed him, I swear it! Why does no-one believe me?!?!!! LOL!